This is a poster I made for a somewhat fictitious band, Clockjacker. 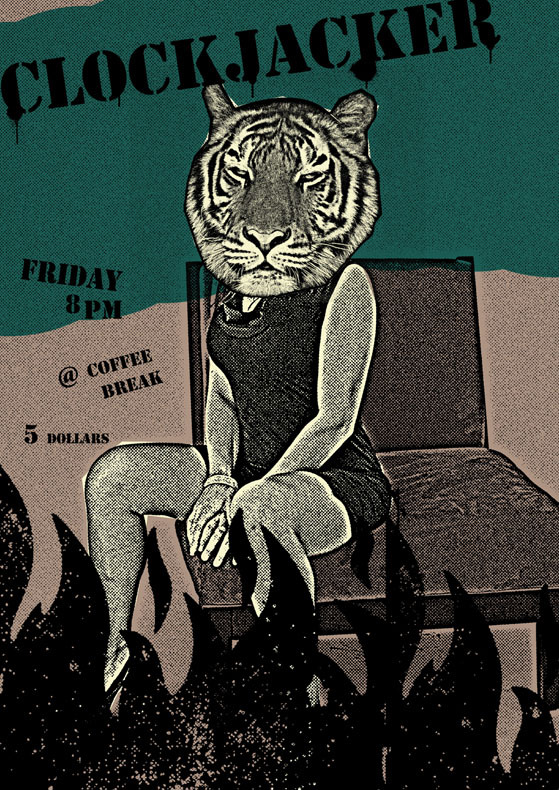 This, of course, is also a fictitious gig, so don’t go to The Coffee Break and ask which Friday Clockjacker is playing. As always,click for larger image. Over the summer, Ian asked me (we were of course at The Coffee Break), “If you could pick your own crew for a spaceship, who would you pick?” We had been watching a lot of “Firefly” at the time and most of our conversations centered around Joss Whedon, the crew he created and the stories he told. My original line-up at the coffee shop included Fezzik from The Princess Bride as my “heavy” or “muscle” or whatever you wanna call him. I don’t remember who my pilot was…or my first mate, for that matter. Odd. Anyway, the next day I refined my list, replacing all trademarked characters such as Fezzik with new creations. For example, for my new “muscle” I created a cyclops character named Outis (which is Greek, look it up) and for my first mate I chose to clone the early 19th century female Chinese pirate Ching Shih. I certainly haven’t seen her or her clone in any fiction. So I took those characters and a few others (mechanic, doctor, pilot) and started a little short story for fun. What began as a “short” story ended up being 20 pages as a Word document (weighing in at over 7700 words). I posted it as I went on two different web-sites devoted to fiction and received an amazing amount of feedback. Now I offer the piece to you here as a PDF file. Into the Black by Jeremy Kerr is licensed under a Creative Commons Attribution-Noncommercial-No Derivative Works 3.0 United States License.